India Design Mark was initiated in 2012 by India Design Council (IDC) in cooperation with Japan Institute of Design Promotion (JDP). It is a design standard, a symbol, which recognizes good design. It further symbolizes excellence in form, function, quality, safety, sustainability and innovation and communicates that the product is usable, durable, aesthetically appealing & socially responsible. It offers 4 liquid handling modes – rinsing, dilution, refilling & purging without dismounting the dispenser. It also features two product innovations, EasyKnob™ and FlexiNozzle™, that enhance its ease of use and flexibility. MICROLIT BEATUS also features EasyKnob™ and FlexiNozzle™. 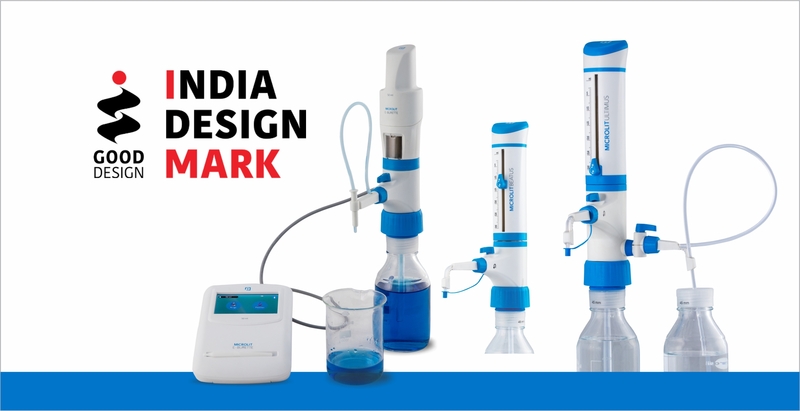 MICROLIT E-BURETTE is a state-of-the-art Motor Operated Burette with sophisticated features and functionality. Built by our in-house team of product design engineers, it offers a host of features like Motor Controlled Piston Movement, a touch screen enabled Control Panel with graphical user interface (GUI), and 3 Calibrated Pre-set Speeds to perform highly accurate titrations. MICROLIT E-BURETTE is widely used in industries like Pharmaceutical, Environmental Monitoring and Food & Beverages.